This stunning Nautical Flag Mirror is made of handpainted tiles. 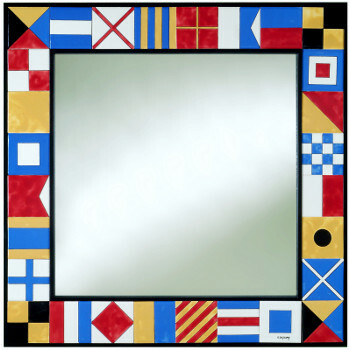 Each vibrant colored tile displays the system of international maritime signal flags. This system of flag signals represents individual letters of the alphabet in signal to or from ships. This one-of-a-kind wall mirror is a perfect accent to your nautical themed bedroom, bathroom or any room! Nautical Flags Mirror measures 19X19"